Not to be confused with minor planet. Ceres as seen from the Dawn spacecraft. It is the only dwarf planet in the asteroid belt. Pluto as viewed by New Horizons space probe on July 13, 2015. Eris and its moon Dysnomia viewed by the Hubble Space Telescope. Makemake and its moon S/2015 (136472) 1 viewed by the Hubble Space Telescope. Haumea and its two moons Namaka and Hi'iaka viewed by the Hubble Space Telescope. A dwarf planet is a planetary-mass object that is neither a true planet nor a natural satellite. That is, it is in direct orbit of a star, and is massive enough for its gravity to compress it into a hydrostatically equilibrious shape (usually a spheroid), but has not cleared the neighborhood of other material around its orbit. The term dwarf planet was adopted in 2006 as part of a three-way categorization of bodies orbiting the Sun, brought about by an increase in discoveries of objects farther away from the Sun than Neptune that rivaled Pluto in size, and finally precipitated by the discovery of an even more massive object, Eris. The exclusion of dwarf planets from the roster of planets by the IAU has been both praised and criticized. As of July 2008 the International Astronomical Union (IAU) recognizes five dwarf planets: Ceres in the asteroid belt, and Pluto, Haumea, Makemake, and Eris in the outer Solar System. Only two of these bodies, Ceres and Pluto, have been observed in enough detail to demonstrate that they actually fit the IAU's definition. The IAU accepted Eris as a dwarf planet because it is more massive than Pluto. They subsequently decided that unnamed trans-Neptunian objects with an absolute magnitude brighter than +1 (and hence a diameter of ≥838 km assuming a geometric albedo of ≤1) are to be named under the assumption that they are dwarf planets. At the time (and still as of 2019), the only additional bodies to meet this secondary criterion were Haumea and Makemake. Starting in 1801, astronomers discovered Ceres and other bodies between Mars and Jupiter which were for decades considered to be planets. Between then and around 1851, when the number of planets had reached 23, astronomers started using the word asteroid for the smaller bodies and then stopped naming or classifying them as planets. With the discovery of Pluto in 1930, most astronomers considered the Solar System to have nine planets, along with thousands of significantly smaller bodies (asteroids and comets). For almost 50 years Pluto was thought to be larger than Mercury, but with the discovery in 1978 of Pluto's moon Charon, it became possible to measure Pluto's mass accurately and to determine that it was much smaller than initial estimates. It was roughly one-twentieth the mass of Mercury, which made Pluto by far the smallest planet. Although it was still more than ten times as massive as the largest object in the asteroid belt, Ceres, it had one-fifth the mass of Earth's Moon. Furthermore, having some unusual characteristics, such as large orbital eccentricity and a high orbital inclination, it became evident that it was a different kind of body from any of the other planets. In the 1990s, astronomers began to find objects in the same region of space as Pluto (now known as the Kuiper belt), and some even farther away. Many of these shared several of Pluto's key orbital characteristics, and Pluto started being seen as the largest member of a new class of objects, plutinos. This led some astronomers to stop referring to Pluto as a planet. Several terms, including subplanet and planetoid, started to be used for the bodies now known as dwarf planets. By 2005, three trans-Neptunian objects comparable in size to Pluto (Quaoar, Sedna, and Eris) had been reported. It became clear that either they would also have to be classified as planets, or Pluto would have to be reclassified. Astronomers were also confident that more objects as large as Pluto would be discovered, and the number of planets would start growing quickly if Pluto were to remain a planet. Eris (then known as 2003 UB313) was discovered in January 2005; it was thought to be slightly larger than Pluto, and some reports informally referred to it as the tenth planet. As a consequence, the issue became a matter of intense debate during the IAU General Assembly in August 2006. The IAU's initial draft proposal included Charon, Eris, and Ceres in the list of planets. After many astronomers objected to this proposal, an alternative was drawn up by the Uruguayan astronomers Julio Ángel Fernández and Gonzalo Tancredi: they proposed an intermediate category for objects large enough to be round but which had not cleared their orbits of planetesimals. Dropping Charon from the list, the new proposal also removed Pluto, Ceres, and Eris, because they have not cleared their orbits. Although concerns were raised about the classification of planets orbiting other stars, the issue was not resolved; it was proposed instead to decide this only when such objects start to be observed. 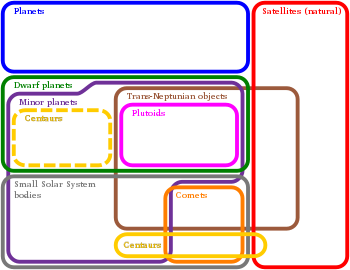 Euler diagram showing the types of bodies in the Solar System (except the Sun). The term dwarf planet has itself been somewhat controversial, as it could imply that these bodies are planets, much as dwarf stars are stars. This is the conception of the Solar System that Stern promoted when he coined the phrase. The older word planetoid ("having the form of a planet") has no such connotation, and is also used by astronomers for bodies that fit the IAU definition. 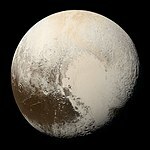 Brown states that planetoid is "a perfectly good word" that has been used for these bodies for years, and that the use of the term dwarf planet for a non-planet is "dumb", but that it was motivated by an attempt by the IAU division III plenary session to reinstate Pluto as a planet in a second resolution. Indeed, the draft of Resolution 5A had called these median bodies planetoids, but the plenary session voted unanimously to change the name to dwarf planet. The second resolution, 5B, defined dwarf planets as a subtype of planet, as Stern had originally intended, distinguished from the other eight that were to be called "classical planets". Under this arrangement, the twelve planets of the rejected proposal were to be preserved in a distinction between eight classical planets and four dwarf planets. Resolution 5B was defeated in the same session that 5A was passed. Because of the semantic inconsistency of a dwarf planet not being a planet due to the failure of Resolution 5B, alternative terms such as nanoplanet and subplanet were discussed, but there was no consensus among the CSBN to change it. In most languages equivalent terms have been created by translating dwarf planet more-or-less literally: French planète naine, Spanish planeta enano, German Zwergplanet, Russian karlikovaya planeta (карликовая планета), Arabic kaukab qazm (كوكب قزم), Chinese ǎixíngxīng (矮行星), Korean waesohangseong (왜소행성; 矮小行星), but in Japanese they are called junwakusei (準惑星) meaning "subplanets" or "almost-planets". IAU Resolution 6a of 2006 recognizes Pluto as "the prototype of a new category of trans-Neptunian objects". The name and precise nature of this category were not specified but left for the IAU to establish at a later date; in the debate leading up to the resolution, the members of the category were variously referred to as plutons and plutonian objects but neither name was carried forward, perhaps due to objections from geologists that this would create confusion with their pluton. Showing the planets and the largest known sub-planetary objects (purple) covering the orbital zones containing likely dwarf planets. All known possible dwarf planets have smaller discriminants than those shown for that zone. (1) Mass in M⊕, the unit of mass equal to that of Earth (5.97 × 1024 kg). (2) Λ is the capacity to clear the neighbourhood (greater than 1 for planets) by Stern and Levison. Λ = k M2 a−3/2, where k = 0.0043 for units of Yg and AU, and a is the body's semi-major axis. (3) µ is Soter's planetary discriminant (greater than 100 for planets). µ = M/m, where M is the mass of the body, and m is the aggregate mass of all the other bodies that share its orbital zone. (4) Π is the capacity to clear the neighbourhood (greater than 1 for planets) by Margot. Π = k M a−9/8, where k = 807 for units of Earth masses and AU. Alan Stern and Harold F. Levison introduced a parameter Λ (lambda), expressing the likelihood of an encounter resulting in a given deflection of orbit. The value of this parameter in Stern's model is proportional to the square of the mass and inversely proportional to the period. This value can be used to estimate the capacity of a body to clear the neighbourhood of its orbit, where Λ > 1 will eventually clear it. A gap of five orders of magnitude in Λ was found between the smallest terrestrial planets and the largest asteroids and Kuiper belt objects. Using this parameter, Steven Soter and other astronomers argued for a distinction between planets and dwarf planets based on the inability of the latter to "clear the neighbourhood around their orbits": planets are able to remove smaller bodies near their orbits by collision, capture, or gravitational disturbance (or establish orbital resonances that prevent collisions), whereas dwarf planets lack the mass to do so. Soter went on to propose a parameter he called the planetary discriminant, designated with the symbol µ (mu), that represents an experimental measure of the actual degree of cleanliness of the orbital zone (where µ is calculated by dividing the mass of the candidate body by the total mass of the other objects that share its orbital zone), where µ > 100 is deemed to be cleared. Jean-Luc Margot refined Stern and Levison's concept to produce a similar parameter Π (Pi). It is based on theory, avoiding the empirical data used by Λ. Π > 1 indicates a planet, and there is again a gap of several orders of magnitude between planets and dwarf planets. There are several other schemes that try to differentiate between planets and dwarf planets, but the 2006 definition uses this concept. Sufficient internal pressure, caused by the body's gravitation, will turn a body plastic, and sufficient plasticity will allow high elevations to sink and hollows to fill in, a process known as gravitational relaxation. Bodies smaller than a few kilometers are dominated by non-gravitational forces and tend to have an irregular shape. Larger objects, where gravitation is significant but not dominant, are "potato" shaped; the more massive the body is, the higher its internal pressure and the more rounded its shape, until the pressure is sufficient to overcome its internal compressive strength and it achieves hydrostatic equilibrium. At this point a body is as round as it is possible to be, given its rotation and tidal effects, and is an ellipsoid in shape. This is the defining limit of a dwarf planet. When an object is in hydrostatic equilibrium, a global layer of liquid covering its surface would form a liquid surface of the same shape as the body, apart from small-scale surface features such as craters and fissures. If the body does not rotate, it will be a sphere, but the faster it rotates, the more oblate or even scalene it becomes. If such a rotating body were to be heated until it melted, its overall shape would not change when liquid. The extreme example of a non-spherical body in hydrostatic equilibrium is Haumea, which is twice as long along its major axis as it is at the poles. If the body has a massive nearby companion, then tidal forces come into effect as well, distorting it into a prolate spheroid. An example of this is Jupiter's moon Io, which is the most volcanically active body in the Solar System due to effects of tidal heating. Tidal forces also cause a body's rotation to gradually become tidally locked, such that it always presents the same face to its companion. An extreme example of this is the Pluto–Charon system, where both bodies are tidally locked to each other. Earth's Moon is also tidally locked, as are many satellites of the gas giants. The upper and lower size and mass limits of dwarf planets have not been specified by the IAU. There is no defined upper limit, and an object larger or more massive than Mercury that has not "cleared the neighbourhood around its orbit" would be classified as a dwarf planet. The lower limit is determined by the requirements of achieving a hydrostatic equilibrium shape, but the size or mass at which an object attains this shape depends on its composition and thermal history. The original draft of the 2006 IAU resolution redefined hydrostatic equilibrium shape as applying "to objects with mass above 5×1020 kg and diameter greater than 800 km", but this was not retained in the final draft. Empirical observations suggest that the lower limit will vary according to the composition and thermal history of the object. For a body made of rigid silicates, such as the stony asteroids, the transition to hydrostatic equilibrium should occur at a diameter of approximately 600 km and a mass of 3.4×1020 kg. For a body made of less rigid water ice, the limit should be about 320 km and 1019 kg. 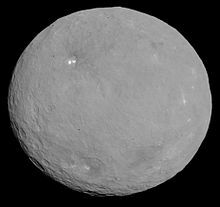 In the asteroid belt, Ceres is the only body that clearly surpasses the silicaceous limit (though it is actually a rocky–icy body), and its shape is an equilibrium spheroid. 2 Pallas and 4 Vesta are rocky and are just below the limit. Pallas, at 525–560 km and 1.85–2.4×1020 kg, is "nearly round" but still somewhat irregular. Vesta, at 530 km and 2.6×1020 kg, deviates from an ellipsoid shape primarily due to a large impact basin at its pole. Many trans-Neptunian objects (TNOs) are thought to have icy cores and therefore would require a diameter of perhaps 400 km (250 mi)—only about 3% of that of Earth—to relax into gravitational equilibrium. As of January 2015[update], about 150 known TNOs are considered potential dwarf planets, although only rough estimates of the diameters of most of these objects are available. A team is investigating thirty of these, and think that the number will eventually prove to be around 200 in the Kuiper belt, with thousands more beyond. 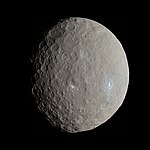 Ceres – discovered on January 1, 1801, 45 years before Neptune. Considered a planet for half a century before reclassification as an asteroid. Accepted as a dwarf planet by the IAU on September 13, 2006. Pluto ♇ – discovered on February 18, 1930. Classified as a planet for 76 years. Reclassified as a dwarf planet by the IAU on August 24, 2006. Haumea – discovered on December 28, 2004. Accepted by the IAU as a dwarf planet on September 17, 2008. Makemake – discovered on March 31, 2005. Accepted by the IAU as a dwarf planet on July 11, 2008. Eris – discovered on January 5, 2005. Called the "tenth planet" in media reports. Accepted by the IAU as a dwarf planet on September 13, 2006. Liberal estimates are that another hundred or so known objects in the Solar System may be dwarf planets. Such estimates are that up to 200 dwarf planets will be identified when the entire region known as the Kuiper belt is explored, and that the number may exceed 10,000 when objects scattered outside the Kuiper belt are considered. Individual astronomers recognize several of these, and Brown maintains a list of hundreds of candidate objects, ranging from "nearly certain" to "possible" dwarf planets. However, it has been proposed that dark, low-density bodies smaller than 900–1000 km in diameter may retain internal porosity from their formation, never having fully collapsed into solid planetary bodies, in which case they could not be dwarf-planets. As of Feb 2018, Brown's list includes 952 objects, identifying ten known trans-Neptunian objects—the four accepted by the IAU plus the six bodies: 2007 OR10, Quaoar, Sedna, Orcus, (307261) 2002 MS4 and Salacia—as "near certain", with another 26 "highly likely". Notably, 2007 OR10 (1253 km) has a larger diameter than Pluto's largest moon Charon (1212 km). Tancredi et al. advised the IAU to officially accept Orcus, Sedna and Quaoar. In addition, Tancredi considers the five TNOs Varuna, Ixion, 2003 AZ84, 2004 GV9, and 2002 AW197 to be dwarf planets as well. Stern states that there are more than a dozen known dwarf planets. However, Grundy et al. cast doubt on the possibility that Salacia, Varda and similar objects are planetary bodies, while accepting that Orcus and Quaoar probably are (or at least are solid bodies). Vesta, the next-most-massive body in the asteroid belt after Ceres, is roughly spherical, deviating mainly because of massive impacts that formed Rheasilvia and Veneneia crater after it solidified. Furthermore, its triaxial dimensions are not consistent with hydrostatic equilibrium. Triton is thought to be a captured dwarf planet. Phoebe is a captured body that, like Vesta, is no longer in hydrostatic equilibrium, but is thought to have been so early in its history. On March 6, 2015, the Dawn spacecraft began to orbit Ceres, becoming the first spacecraft to orbit a dwarf planet. On July 14, 2015, the New Horizons space probe flew by Pluto and its five moons. Dawn has also explored the former dwarf planet Vesta. Phoebe has been explored by Cassini (most recently) and Voyager 2, which also explored Triton. These three are thought to be former dwarf planets and therefore their exploration helps in the study of the evolution of dwarf planets. In the immediate aftermath of the IAU definition of dwarf planet, some scientists expressed their disagreement with the IAU resolution. Campaigns included car bumper stickers and T-shirts. Mike Brown (the discoverer of Eris) agrees with the reduction of the number of planets to eight. NASA has announced that it will use the new guidelines established by the IAU. 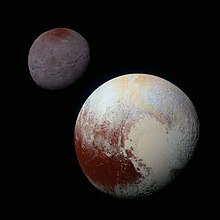 Alan Stern, the director of NASA's mission to Pluto, rejects the current IAU definition of planet, both in terms of defining dwarf planets as something other than a type of planet, and in using orbital characteristics (rather than intrinsic characteristics) of objects to define them as dwarf planets. Thus, in 2011, he still referred to Pluto as a planet, and accepted other dwarf planets such as Ceres and Eris, as well as the larger moons, as additional planets. Several years before the IAU definition, he used orbital characteristics to separate "überplanets" (the dominant eight) from "unterplanets" (the dwarf planets), considering both types "planets". Nineteen moons are known to be massive enough to have relaxed into a rounded shape under their own gravity, though some have since frozen out of equilibrium, and seven of them are more massive than either Eris or Pluto. These moons are not physically distinct from the dwarf planets, but do not fit the IAU definition of dwarf planet because they do not directly orbit the Sun. However, Alan Stern calls planetary-mass moons "satellite planets", one of three categories of planet, together with dwarf planets and classical planets. The term planemo ("planetary-mass object") also covers all three populations. The seven moons that are more massive than Eris are Earth's Moon, the four Galilean moons of Jupiter (Io, Europa, Ganymede and Callisto), one moon of Saturn (Titan), and one moon of Neptune (Triton). Another moon of Saturn (Rhea), and likely one or two of Uranus (Titania and Oberon), are also in hydrostatic equilibrium. However, the other five ellipsoidal moons of Saturn (Mimas, Enceladus, Tethys, Dione and Iapetus) were once in equilibrium but are no longer. For the three other ellipsoidal moons of Uranus (Miranda, Ariel and Umbriel) and Pluto's moon Charon, the situation in unclear. There are additional possibilities of equilibrium moons among TNOs, including Eris's moon Dysnomia, though these are smaller and thus less likely. In a draft resolution for the IAU definition of planet, both Pluto and Charon would have been considered dwarf planets in a binary system, given that they both satisfied the mass and shape requirements for dwarf planets and revolved around a common center of mass located between the two bodies (rather than within one of the bodies). [note 1] The IAU currently states that Charon is not considered to be a dwarf planet and is just a satellite of Pluto, although the idea that Charon might qualify to be a dwarf planet in its own right may be considered at a later date. The location of the barycenter depends not only on the relative masses of the bodies, but also on the distance between them; the barycenter of the Sun–Jupiter orbit, for example, lies outside the Sun. This page is based on the Wikipedia article Dwarf planet; it is used under the Creative Commons Attribution-ShareAlike 3.0 Unported License (CC-BY-SA). You may redistribute it, verbatim or modified, providing that you comply with the terms of the CC-BY-SA.